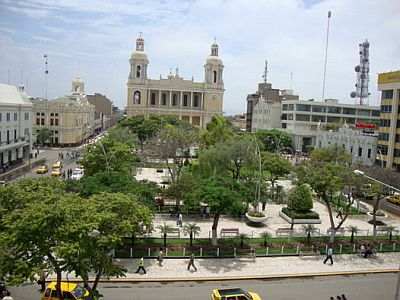 In Chiclayo, the fourth largest city in Peru, the climate is subtropical arid, with a hot season from January to April, and a relatively cool season from June to November. Chiclayo is located in the northern part of the Peruvian coast (or better, a short distance from the coast), in the region of Lambayeque, and despite the position, about 6 degrees south of the equator, the climate is arid, and relatively cool in winter. This happens because of the cold marine current, known as Humboldt current. The landscape in the region is virtually desert, except in areas where the rivers flowing from the Andes are used to irrigate fields; to find somewhat green areas, you have to go to the east, at the foot of the Andes, where there are nature reserves, such as the Refugio de Vida Silvestre Laquipampa, where the altitude ranges from 300 meters (1,000 feet) in the southern part to almost 3,000 meters (10,000 feet) in the northern part; the Bosque Moyan - Palacio, where the altitude ranges from 350 meters (1,100 feet) to nearly 1,800 meters (6,000 feet); and the Reserva Ecologica Chaparri, more arid, located near the city, and whose altitude reaches nearly 1,400 meters (4,600 ft). In the northeastern part of the Lambayeque region, we are now in the Andean zone: Incahuasi is located at 3,000 meters (10,000 feet) above sea level. Near the city we find the archaeological complexes of Túcume, where there are 250 decaying brick pyramids, and Sipán. On the coast, there are seaside resorts such as Puerto Eten and Pimentel, where you can swim and surf. The rains are generally very poor, in fact they are lower than 100 millimeters (4 inches) per year. However, from January to April rare rains occur, which in the years of El Niño, the phenomenon of an abnormal warming of the Pacific Ocean to the west of South America, may become more abundant, though not at the level of Tumbes (which is located in the northernmost part of Peru, and whose climate during the years of El Niño becomes tropical). In the most intense periods of El Niño, however, the rainfall increases as well as the temperature: highs from January to April (or even May) can often reach 33/34 °C (91/93 °F), with peaks of 35/36 °C (95/97 °F). As for the rains, for example, in 1983, 320 mm (13 in) of rain fell, of which 120 mm (4.7 in) fell in January, and 95 mm (3.7 in) in a single day; almost no rain fell in February, 85 mm (3.3 in) in March, and 90 mm (3.5 in) in April. In 1998, precipitation amounted to 70 mm (2.8 in) in January, 200 mm (8 in) in February, of which 115 mm (4.5 in) fell in one day, 145 mm (5.7 in) in March and 30 mm (1.2 in) April, for a total of 455 mm (18 in) in one year. Although they are rare, heavy rains, when they are concentrated in a few hours, are dangerous and can cause flooding. The amount of sunshine in Chiclayo is generally good, but it is not excellent, in fact the Humboldt current can cause low clouds and fog, especially during the cool season, from June to August, though less than in Lima. Normally, the sea in Chiclayo is not very warm: it is warm enough for swimming in February and March, while it is very cool from July to November, when it drops to 18/19 °C (64/66 °F). However, in the years of El Niño, the sea in this area warms up a lot, so much so that it can reach 29 °C (84 °F) in the early months of the year.